Especially since no such film was made during the band’s original run in the 90s, longtime fans would probably be satisfied with any decently made concert film from the Archers of Loaf’s 2011-12 reunion gigs. This longtime fan is happy to say, though, that What Did You Expect? 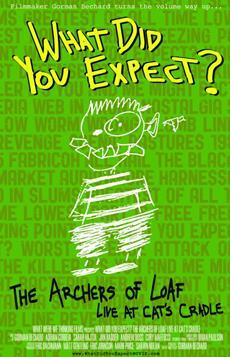 The Archers of Loaf Live at Cat’s Cradle is more than just a “decent” rendering of the live Archers experience. Filmmaker Gorman Bechard and his production team have artfully captured the Archers’ energy and skill on stage, the bouncing, lyrics-shouting revelry the band inspires among their audience, and the enveloping joy of just being in the room amidst it all. I was fortunate enough to see one of the Atlanta shows a month prior to the filming of this set at the famed Cat’s Cradle, and many of my observations of that show also apply to the band’s performances in this film. As I wrote in July 2011, if anything, the band sounds better now than they did back in the 90s. Eric Bachmann’s years of “quiet” singing in Crooked Fingers have clearly informed how he approaches Archers classics as a vocalist. Bassist Matt Gentling is still a lovable wiseass as the band’s primary “host” between songs. The reunited foursome is tight and well rehearsed, with spot-on timing and solid accuracy in their playing. Best of all, they seem to be having a great time once again cranking out these tunes after a decade-plus hiatus, and they seem to get real satisfaction from the fans’ enthusiastic reactions (Bachmann confirms that notion in the film). Given that robust set list, heavy on the band’s most beloved songs, and the previously mentioned quality of the performances, Archers fans old and new who weren’t able to see the reunion gigs should find What Did You Expect? to be a worthy consolation prize. And those of us who were able to catch one of the shows now have the perfect memento—the ability to “see it again” anytime we want. Or at least we’ll have that when the DVD is released—soon, I hope! Thankfully, the gift of this performance also comes wrapped in some lovely packaging. Simply stated, this is a really well-done concert documentary. Courtesy of Brian Paulson (audio), Gorman Bechard (video), and their team, the film looks and sounds fantastic. The cuts between the six camera angles are skillful and unobtrusive, and the camera placements and movements are nicely used to convey intimacy and intensity. The interviews with the band, interspersed throughout the film, are funny, engaging, and even revealing. For example, I learned during the film that Eric Johnson is an attorney, Eric Bachmann’s been playing the same hand-built guitar for 20 years, the band once talked their way into a private, illuminated viewing of Mount Rushmore in the dead of night, and everybody wants to play “Underdogs of Nipomo” but can’t figure out how they did the song originally. My only complaint about the film’s content, and it’s a very minor complaint, is that I wish it gave wider contextual information and viewpoints on 90s indie-rock history. Except for a brief reminiscence from Eric Johnson about recording Icky Mettle in the old Cat’s Cradle, there’s nothing about the iconic club or the larger music scene that put Chapel Hill and the Research Triangle on the cultural map. Attentive fans know that Chapel Hill is often mentioned in the same breath as Athens and Minneapolis among the greatest regional scenes in the history of underground rock. Both the Archers and Cat’s Cradle, along with other players such as Superchunk and Merge Records, were key builders of Chapel Hill’s lofty status in the 90s. That story remains untold in What Did You Expect? But actually, to argue against my own point, the history of Chapel Hill is really a larger story that could probably be better told separately from an Archers concert film—perhaps in another doc from Gorman Bechard? Given the excellence of What Did You Expect?, I’m confident that future rock stories that Bechard chooses to tell (including his current project on Husker Du’s Grant Hart) will be in good hands. Above all, I’m just glad that, for a while, Bechard turned his skill and attention toward my favorite band from my youth. ← Dexter Season 7: How Crazy Will It Get?